"Get to know me!" Workout! It's a brand new type of workout class for those of you not too familiar with Bill Holmes and the way he works. See if the Doctor's methods are right for you before jumping into his 4 week class! This is not a class but a Workout! 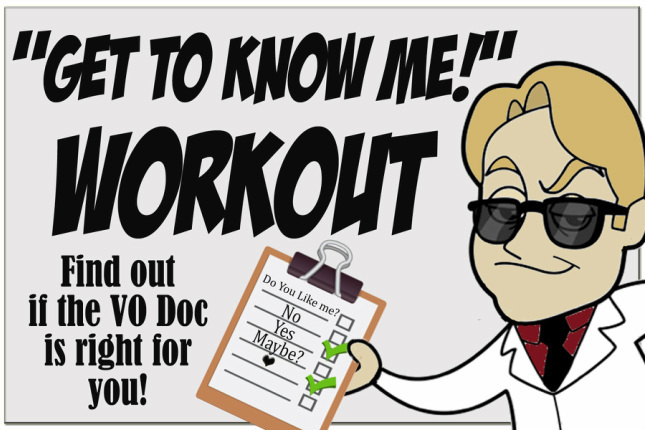 Meaning: Bill Holmes The Voiceover Doctor will conduct the workout much like the Voiceover Audition Class with instruction and direction for one night only. The class is geared mainly toward those who are somewhat new to the technique that the Doctor teaches. There will be a review of the technique within the first hour of the class then we will practice what he preaches with random scripts of your choosing.